8.5 billion hours of care for persons with Alzheimer’s (Alzheimer’s Association, 2009). Research has shown that 87% of persons with Alzheimer’s are cared for at home by a family member (Alzheimer’s Association, 2009). While needing to keep up with the needs of their own demanding lives including taking care of a family, maintaining an income and endless household chores, many caregivers find the job of caring for a person with Alzheimer’s to be the most demanding and exhausting job of all. Some caregivers say they are working on a 24 hour clock. Not only is the job physically and mentally exhausting, trying to understand the new needs of this person they care about, many caregivers find the emotional needs to be most depleting of all. Studies have shown that caregiving was correlated with depressed immune systems for up to three years after the caregiving experience, often leading to chronic illness for the caregiver (caregiving.org). Furthermore, studies have shown that over all wellbeing scores were much lower in caregivers with 40-70% of caregivers displaying significant symptoms of depression (caregiving.org). While DementiAbility has in the past focused on educating doctors, nurses, OTs and physiotherapists on how to improve lives for persons with dementia, after much demand Gail Elliot has written a book with the objective of supporting caregivers and those supporting persons with dementia in the community at large. Through the use of her caregiving book, caregivers can set up the environment to empower those with dementia leading to increased independence and overall improved quality of life. 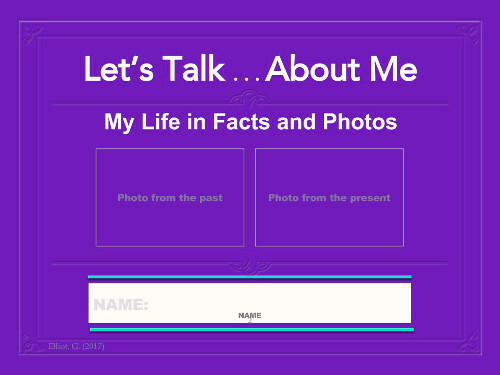 A memory book for those who would like to share facts and photos of their lives with others. Download and start adding details today! Generally, these terms are not well understood. Dementia is a term that is used to describe a variety of disorders that affect the brain and cognitive ability. Over time, dementia will increasingly affect the ability to think and to remember, to the point that it will impact social and occupational functioning in daily life. There are a number of types of dementia that fit under the dementia umbrella. Alzheimer’s disease is only one of the many types of dementia. Since there are a number of types of dementia, someone may have a dementia, but it may not be an Alzheimer’s form of dementia. Other forms of dementia include, but are not limited to, vascular dementia, Frontotemporal Disease, Lewy body disease and mixed dementias. Each type of dementia has its own distinguishing features and characteristics, such as memory and judgment. Memory loss is usually the first sign of an Alzheimer’s type dementia but may not be the first sign of a frontal vascular dementia. With a frontal vascular dementia judgment and the ability to understand and appreciate the consequences of decisions may appear long before signs of memory loss. For a full understanding of the terms, definitions and descriptions, visit any Alzheimer’s society website locally, nationally and/or internationally. Is dementia a growing concern? One out of every three seniors will be diagnosed with Alzheimer’s or some other form of dementia (www.alz.org). It is estimated that there is one case somewhere in the world ever four seconds (Alzheimers Disease International). About 15% of people over the age of 65 have dementia (Alzheimer Society of Canada, 2015). About 5 million Americans have Alzheimer’s disease or other form of dementia (www.alz.org) and 44.4 million people are living with dementia worldwide (www.alz.co.uk). My mission is to help people see that individuals with dementia have many spared abilities – and these need to be clearly exposed. I want people with dementia to reach their highest potential in all aspects of living. This means we, the providers of care, need to identify remaining abilities and then support them, according to the needs and interests of each individual. People with dementia have many abilities that often lay dormant because people don’t realize that they are still able to do many of the things they could do in the past. The reason some people with dementia struggle with leisure activities, as well as activities of daily living, is due to the changes to the brain that impact memory and cognition. If we can learn to adapt the environment to address these changes to the brain, the person with dementia may be able to do far more than expected. In other words, when we create an environment where people with dementia can be more successful in all aspects of living we set the person up for success, and this not only improves function, it enhances self-esteem. Enhancing abilities in all aspects of living, from the time that they get up in the morning to the time that they go to bed at night, is central to the DementiAbility Methods. While we can’t reverse the disease, we can support the abilities that are spared. The DementiAbility Methods can help people with dementia to be the best they can be. Why is the work that you do important? Most people think of dementia as a prognosis with a steady and debilitating decline. While the decline may be inevitable, we can slow it down, support quality of life and enhance function and self-esteem when we provide opportunities for people with dementia to be engaged, successfully, in all aspects of living. We often talk about children not working at their highest potential. Both research and my personal experiences have proven that when we support the person in a prepared environment we can help people with dementia to engage in a life with purpose and meaning according to remaining abilities. The key element is to adapt the environment according to individual needs. A lot of people talk about the behavioural challenges associated with dementia, can you tell me about this? The most important thing to realize is that all behavior has meaning. This is particularly so for people with dementia. Research has shown that there are three main reasons for these behavioural challenges (which we refer to as responsive behaviours): boredom, loneliness and lack of independence. Boredom arises because we remove too many activities of life from the world of those who become increasingly affected by changes to their brain. We often take away tasks because we think the person is not “able” to do things. We just need to learn to do things differently. DementiAbility Methods focus on teaching people how to achieve this goal. Loneliness is also problematic because people often struggle to find meaning when interacting with those who are challenged by cognitive loss. We need to incorporate things to do that involve social interactions that produce outcomes that are successful. The lack of independence that is associated with dementia comes from not being able to find things and/or locations and also includes the inability to complete tasks in the right order (such as knowing what to do first when you get dressed or go to the toilet). Each of these concerns can be addressed using the approaches we teach using DementiAbility Methods. How do you address boredom when people with dementia have reduced abilities? The best way to support a person with dementia is to know who the person is and who the person was. You need to identify interests and then adapt leisure activities and activities of daily life to meet the needs, according to interests and abilities. There is no single way to address the needs of all people. Each person is unique. Once you discover what the person would enjoy doing, activities need to be set up for success. For example, if you play trivia you need to provide the answers (e.g. – is the answer “a” or “b”, with one answer being obviously incorrect), rather than asking them to retrieve the answer from an impaired brain. All information that an individual with dementia requires should be in the environment. Also, we need to put roles back into their lives, and give them things to do that they used to do. Put the supports in their environment (such as a placemat that outlines where things are placed on the table) and break each task down to their level of ability (e.g. – put the plates on the table, rather than everything, if their cognitive abilities are limited). Someone who enjoyed doing puzzles in the past might enjoy doing them in the present, but you need to modify it to their current ability (e.g. – find easier puzzles and photo copy the completed puzzle so they can put the pieces directly on top of the image). Are most people with dementia living in nursing homes? It is estimated that about 2/3 of people with dementia are living in the community and about 1/3 are living in long term care. Regardless of where people with dementia are living, they need to have things to do. We need to give them the jobs they have always done such as making beds, doing dishes, setting tables, dusting and any other chore that is familiar and within their range of their abilities. The most important thing is that families and staff need to understand that people with dementia need a reason to get out of bed, they need something to look forward to, someone to love and they need to find meaning and purpose in each day. So regardless of where they are living, either in LTC or in their homes, we need to continue to create an environment where they can enjoy quality living. There are many empty hours in the day of those living with dementia. These empty hours need to be filled! What do you teach people who support individuals with dementia? We hold workshops for staff and we also hold workshops for loved ones. Our workshops are designed to help staff understand the needs of individuals with dementia. We teach them about the importance of working as a team and we emphasize the importance of “seeing the person beneath the dementia”. When this is accomplished we shift the focus from an antiquated system of completing “tasks” to one that focuses on meeting the needs of the whole person. Families also need to know how to understand the changes to the brain and how to adapt the both activities of daily life and leisure activities. Families can learn about our methods by attending our Caregiver Workshops and/or by reading our newly released caregiving book entitled ‘Helping me Helping You’. What makes your caregiving book different? “Helping Me. . .Helping You” – the name of my caregiving book – focuses on helping caregivers to help their loved ones, while finding new approaches that are aimed at helping them too. I help caregivers understand the connections between the brain and behaviour and then I discuss a model that I created to help people figure out what it is they can do to support those with dementia. 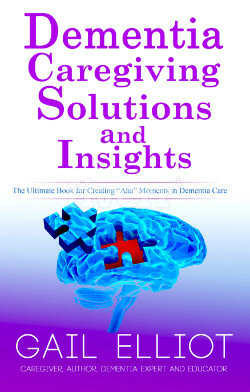 The book contains practical tools and approaches that caregivers have found to be helpful. The book is largely based on the workshop I provide for caregivers. Caregivers have said, “This is the best workshop I have ever attended.” And “I wish I had know all of this when I first learned about my (loved one’s) diagnosis.” The feedback has been very positive. Question: I saw that you have a new ipad app out. How is this different from other apps that are currently available? The ‘Best Guess’ App incorporates what we know about dementia, aging eyes and memory loss. The aim of the app is to set people up for success by taking their interests and abilities into account. We offer 8 different categories and within each category we have developed questions that are linked to people who are in their later years. Simplicity, familiarity (with questions that are familiar to that age of user) and supporting memory loss are the key elements of success for people with dementia. With each question two answers are provided. One of which is correct, and the other one is often quite ‘funny’. This design facilitates successful outcomes and minimizes frustration while also providing many moments of joy, one of the overarching goals of the DementiAbility philosophy. Gail Elliot, BASc, MA, Gerontologist & Dementia Specialist, is the Founder and CEO of DementiAbility Enterprises Inc. She was the Assistant Director, Gilbrea Centre for Studies in Aging, at McMaster University for 17 years and took early retirement in March 2012 to focus on dementia education. Gail’s work is being used across Canada and has been implemented globally. In Ontario, the Ministry of Health’s BSO programs have accepted this DementiAbility Methods and Validation Communication workshops are included as two of the core courses in the McMaster University Geriatric Certificate Program. Gail works closely with the Occupational Therapists Association of Hong Kong, Montessori for Dementia Australia and with colleagues in the United States. Gail is the author of the book Montessori Methods for Dementia: Focusing on the Person in the Prepared Environment (currently available in English and Chinese), Memory Aids for Dementia, Caregiving Essentials for Dementia and is co-author of Checklist for Change: A Guide for Facilitating Culture Change in LTC. She is also editor of the many titles available as part of the Carry on Reading in Dementia series.